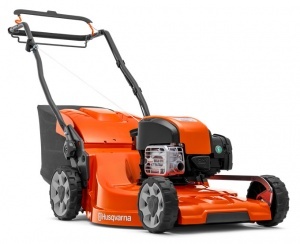 A 53 cm cut petrol lawn mower from Husqvarna, this self-propelled model is easy-to-use, also benefiting from simple starting and coming as standard with a Briggs & Stratton engine, plus a 60 litre collector. A variable speed, self-propelled lawn mower from Husqvarna with a 53 cm working width, ideal for domestic use on larger areas. With easy-starting, a Briggs & Stratton engine plus a 60 litre collector.